Brief Description: Now is the time for all you cycling fans to discover whether you will be awarded a Yellow Jersey and be crowned winner of Le Tour for your efforts in facing the awesome challenge of answering the 1,250 graded questions in this quiz book, or whether you will be pedalling backwards all the way. Test your knowledge of riders, nationalities, courses, teams, managers, stages, time trials, points, years, records, victories and losses throughout the Tour the France’s long history. Do all those jerseys leave you colour blind? Do you know your étape from your peloton? And what does a red flag signify? Encyclopaedic in terms of the vast amount of fascinating information it contains, this book will trigger wide-ranging recollections of Le Tour’s much-loved personalities and memorable events, from its beginnings in 1903 right up to the present day – not a journey for the faint hearted! Special Note: £1 from every copy of the book sold will go to 'The UK’s National Cyclists’ Organisation the CTC Charitable Trust' Charity. This book is also available as an ebook. Reporting the Tour de France each July has been a way of life for me since 1973. It is, without doubt, the most fascinating sporting event of any year and, as you will discover in the excellent little book, it is an occasion which has developed a long history. I am surprised it has taken so long before someone has produced a Quiz Book on La Grande Boucle, but now you have the chance to test your knowledge of the greatest bicycle race on earth. John White has spent many long hours researching this book, discovering little known facts and, in a fun way, now brings a transparency to the event many will never has seen before. Over the thirty-three years I have been covering the race for both newspapers and television, there have been many changes. Henri Desgrange, the founder of the race when it was first held in 1903, could never have foreseen how popular the event would become in 2005. Even in 1904 he was considering cancelling it because of bribery and sabotage, but it survived and now a cast of 4000, move with the race every day. Well done, John, and you might like to know that Paul Sherwen and I will, in 2005, have covered 60 Tours between us. Now where exactly is that question in the book! A Scary thought that Phil Liggett and I have covered 60 Tours between us (33 for him and 27 for me)! The things that I love about commentating at the Tour is the little anecdotes and pieces of history that we have to dig up every year- that's what a lot of people tell me they find so fascinating. Now that this quiz book has come out Phil & I will really have to be on our toes as a lot more people will have access to the quirky little stories and facts about the “greatest bike race in the World.” Since I first rode the Tour in 1978 I have seen the race develop so much recently under the guidance of Jean Marie Leblanc who has been responsible for growing the race into what it is today but retaining it’s much of it’s folklore. I hope you enjoy the book as much as I did and find a few interesting questions to catch out you friends. You might just get a chance to find out how far afield the race is followed- even in Africa they know the “The Tour de France”. By the way, which King of the mountains winner by the way was born in Africa? Answer- Richard Virenque was born in Casablanca!! John's Book is a wonderful idea and packed full of interesting facts and trivia about the greatest cycle race in the world. I can recommend it to all fans of the Tour de France. This quiz book is full of meaty tidbits sure to please every diehard Tour de France fan. At last a Quiz Book about the Tour de France. This Book has it all and covers the Tour from 1903 to Lance's 6th consecutive win in 2004. A must for all cycling fans. Every time you open this book, you’ll gain an incredible amount of knowledge about the sport of cycling. I thought I knew everything about the Tour de France - but then I read this quiz book and realised there is so much more to learn. This is a fantastic book that covers everything there is to know about Le Tour. My wife and I spent hour after hour testing each other and our friends with the questions. As the charitable arm of CTC – the UK’s national cyclists’ organisation the CTC Charitable Trust carries out invaluable work to make cycling safe, welcoming and enjoyable for all. In particular it is concerned with training young cyclists to use the roads for school and sport, and with improving conditions for all cyclists. 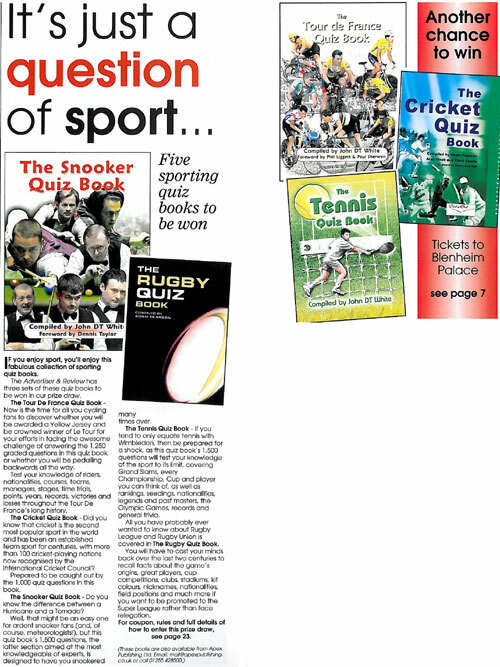 The trust is delighted with the support of the Tour de France Quiz book, cyclists can enjoy their sport off the bike and make a contribution to its future at the same time. Thank you. This Book is a super reference type quiz book about Le Tour. I was impressed with just how much John was able to include - the winners, runners-up, stages, jerseys, history and there is even a section about Spanish Riders. I really enjoyed testing my own knowledge of a race I won and participated in many times. I hope you enjoy this Book as much as I did. 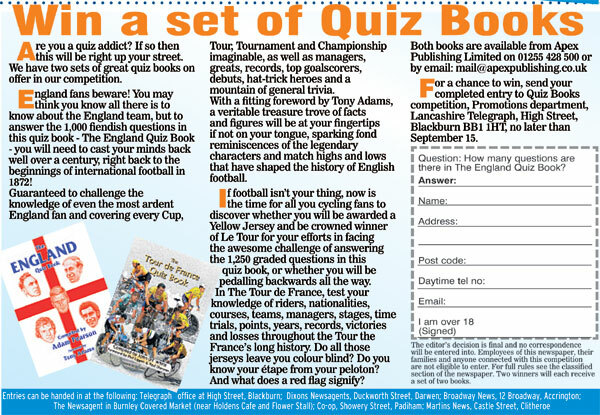 The Tour de France Quiz book, to test yours and others knowledge of the Tour. A perfect tool for a Tour de France evening with you friends. A great way to collect knowledge of the biggest bike race in the world and get a hold of many funny anecdotes. Also includes prefaces from legendary commentators, Phil Liggett, Paul Sherwen and Dave Duffield. There is no doubt that John White is a kindred spirit with the armchair viewer of the world’s greatest cycle race and this is a thoroughly enjoyable challenge for the fan, it would make a great gift. Supplementing the 126 pages of themed questions are appendices of favourite quotes from CTC President Phil Liggett and Paul Sherwen, including the ones they would rather forget. The book is supported by Phil and £1 from each copy sold is to go to his nominated charity – the CTC Charitable Trust. * Answers: Maarten Ducrot and Joop Zoetemelk respectively. Sooner or later, every true cycling lover will end up in a heated debate about forgotten moments in even more forgotten tours. A calm conversation on who won the Tour de France in 1972, or who took the Green Jersey in 1997, could easily turn into a, at least temporarily, damaged friendship. Is there nothing that could avoid these small dramas? Well, there is now! John DT White has dedicated many of his hours to compiling an amount of questions, high enough to keep you and your friends busy for many long nights. 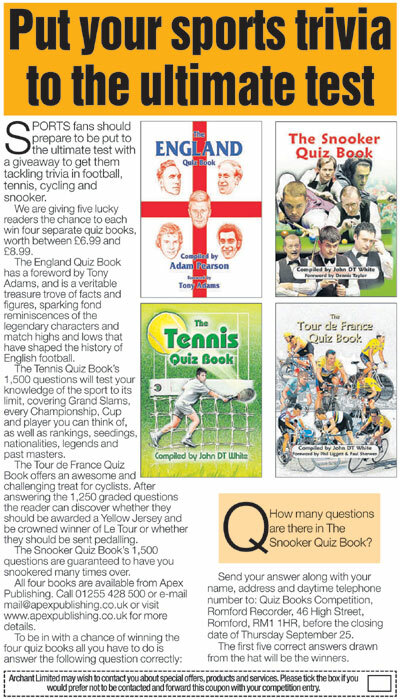 'The Tour de France Quiz Book' has been read and praised by former cyclists like 1988 Tour winner Pedro Delgado, as well as 1977 and 1980 runner-up Hennie Kuiper. As if this is not enough, forewords were added by Tour reporters Phil Liggett and Paul Sherwen, who together are responsible for covering 60 editions of the French race. If you take a quick look at the last page of questions, you will notice that there are no less than 1250 questions to crush your brains over. The questions are conveniently devided into categories, which makes it a lot easier to test your, or someone else's knowledge on a specific topic. The book does not focus on a certain cycling nation, or a certain rider: As a reader, unless you are from an absolutely undiscovered cycling nation such as Lesotho or the Solomon Islands, you will always be able to find some interesting questions on riders from your home country. Possibly the best part of this book is that it also contains a section with all 1250 answers, because you will soon notice that nobody is able to answer all questions correctly, without quickly checking the answer to see whether you were really right. Do you think you can? 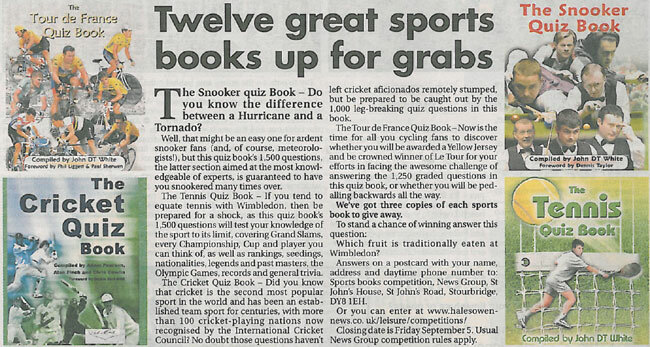 then 'The Tour de France Quiz Book' is a must have to test your knowledge, and to survive those 49 weeks of the year in which you count down the days left till the next Tour. More information about this book can be found at Apex Publishing Ltd.
$TBC £8.99 Think you know everything about the Tour de France, eh? 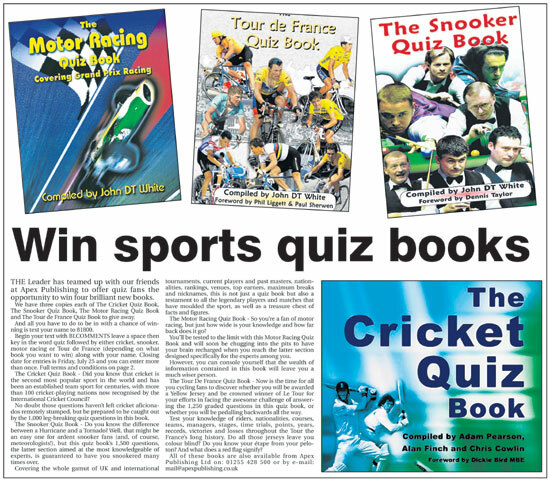 Time to prove it, then, with The Tour de France Quiz Book. With a foreword by Phil Liggett and Paul Sherwen, the subsequent chapters about the race’s riders, jerseys, teams from 1903 to Armstrong’s record sixth win last year total 1,250 questions – tough enough to test the most knowledgeable Tour enthusiast. Available from all good book shops. Impress and delight your friends with this fun and fascinating compilation of Tour trivia. Sorted by topic, questions cover cycling celebrities, Tour firsts, stage results, Liggetisms and Sherwenisms, sponsorships, rider nationalities, and event chronology. There is no other Tour de France book like it. Complete with "experts only" questions and stunning photo spreads. The essential tour facts in this fun quiz book. A great way to test your own or other peoples knowledge of the greatest cycle race on earth with 1250 graded questions. Test your knowledge of riders nationalities courses teams managers stages time trials points years records victories and losses throughout more the 100 years of history. Compiled by John DT White with a foreword by Phil Liggett and Paul Sherwen. What fun! Test your knowledge of the Tour from the first "Giants of the Road" riding their single-speed bikes to present racers on their technical two-wheeled marvels. John White's book very nicely covers the well-known as well as the arcane and obscure facts of the Tour de France. Like any sport, the more one knows about the Tour, the more enjoyable it is to watch. This is a great way to increase that enjoyment. This book is a delightful enterprise, and a rich resource for anyone who loves the drama and spectacle of the world's greatest sports event. Not every cyclist can win the Tour but everyone can test themselves against this huge selection of questions about the great race. What a great idea this Book is and I know it will prove to be a very useful travel companion on the long coach journeys whilst following the Tour de France. I can't wait to test those people following Le Tour with me. Best of Luck with the Book John. As someone who loves the history of the Tour, this quiz book was long overdue. I greatly enjoyed it! A superb idea from John! Enough to whet anyones appetite for Le Tour and bring "The Greatest Race On Earth" a wider accessibility to the general public. Something for everyone in a fun format... GREAT! The Tour De France Quiz Book is the most comprehensive quiz book on the subject, packed full of facts, photos, and questions to test even the most knowledgeable fan. I am no good at cycling but I did find this book extremely interesting, it is far from dull. Will leave you thinking, ‘I never knew that’. The Tour De France Quiz Book wins 8 pizza slices. During the 2005 'Tour de France' - the book was discussed on 'Eurosport' and a few questions were read out. 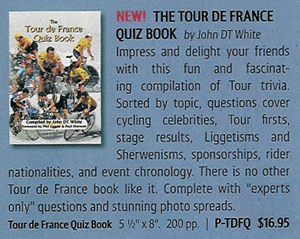 Radio 123 (Netherlands) reviewed 'The Tour de France Quiz Book' compiled by John DT White. 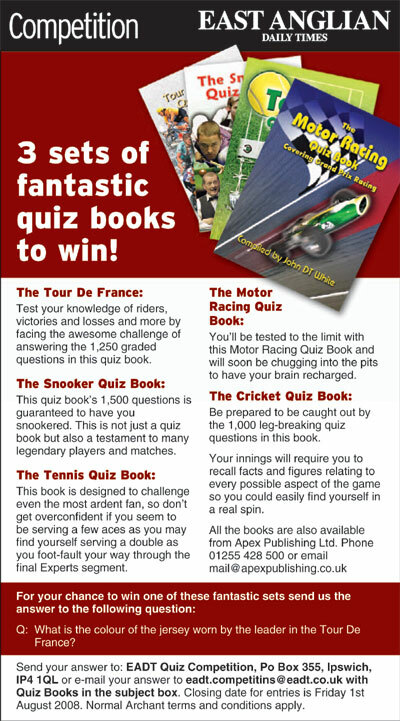 The quiz book is about who’s done what on two wheels in the World’s greatest bike race. So, if you want to confound your friends in the club or the pub, here’s one for you: Q: who was it who rode a tricycle to Paris to see Brian Robinson and Tony Hoare finish the Tour de France in 1955?” A: Me, David Duffield! Enjoy the book! This book covers almost every detail in the Tour's history. Not only valuable as a quiz book, but also as a historical reference book.